With delivery of our veg box I now have the challenge of making meals with a vegetable I have never liked. All my memories are of the soggy tasteless variety or that bitter taste that makes you feel like you are being punished. So I am looking at this with trepidation and with an eye to learning something. For starters I found how to cook cabbage? 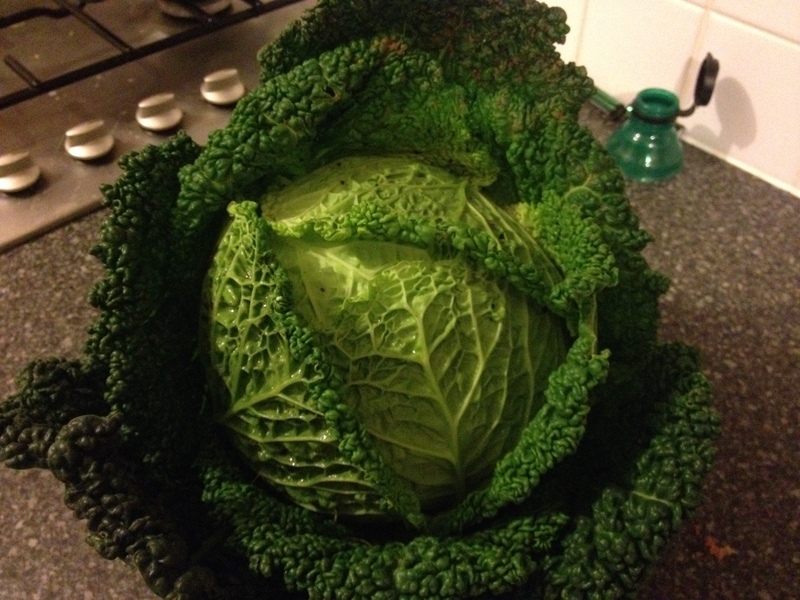 and cabbage from the BBC Good Food site which make it all sounds easy enough. As I think about it I realise I can blanch the cabbage in the water used to boil the potatoes and carrots while I make roast veg. I have already learnt to use this water as stock, so while boiling and blanching I may lose some nutrients to the water but I will be using the water any way for the gravy and as stock so be frozen so nothing is really lost. I have also been reminded that cabbage is a key element for Coleslaw which is something I increasingly want to make for myself so that seems a good option for now. Other than that I don’t have any interesting ideas. I may make a soup but I can’t think of anything special. Crush or slice a garlic clove and sautee it. Then wash and shred some cabbage and add it to the garlic. Cover for 3-4 minutes. Apparently without the garlic the cabbage has no flavour but with it it is lovely. She says this works with soft cabbage and the problem is that mine seems to be quite firm but I may try this any way. I have so much I can try a lot of different things. So if you have any ideas then please share. It would be nice to find a reason to actually want to eat cabbage because the more options I am finding the more fun I am having with food. The good news is that I tried the blanched cabbage when making our roast and it was nice. Not amazing but something I could get used to. The sauteed cabbage didn’t work but I may not have cooked it long enough. I just used a very low heat and left it cooking but it was still hard when I tried it. « How to make coleslaw in 5 minutes!! !